If you ever had the courage to visit my Facebook page or my Pinterest boards, you’ve probably noticed that the knits have become a major inspiration since the cold and wet weather has been hitting Paris. I used to knit but I do not have the patience to finish a sweater anymore, so I chose the easy way: sew a knit fabric. Cut it and assemble it as I want. The sight of the tubular knit has flooded me with images of vanilla foam and childhood knits. It was my Proust’s madeleine which brought back memories of school and knitted tights worn under the uniforms. I bought it without doubting. 2 meters for 10 euros. And I become the owner of this beautiful material, soft and warm that I can transform at will. Firstly, a three holes dress that I embellished with large horizontal strips for the sake of lines. 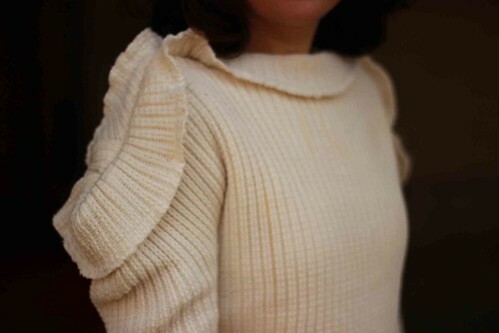 Secondly, a sweater with spirals shoulders for the sake of volume. 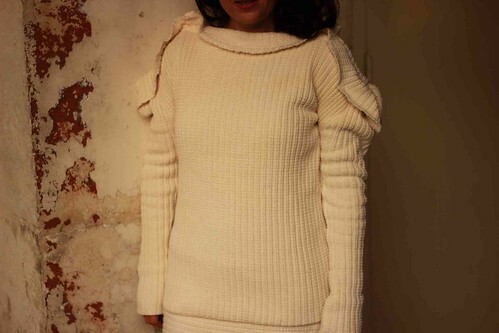 And here’s the sweater worn over the dress with high knit socks. And you, what is your Proustian fabric, if any? This entry was posted in Projects and tagged dress, knit, sweater.